The Office of the Commissioner of the Revenue appraises and assesses for taxation all real property in the City, assesses individual and business personal property taxes, issues business licenses, assists citizens with filing Virginia income taxes, administers special taxes on meals, lodging, admissions, utility services, short term rentals and mobile communications, and administers the City's real estate tax relief and exemption programs and the land use special assessment program. As a state Constitutional Officer, the Virginia General Assembly first created the position of Commissioner of the Revenue in 1786. 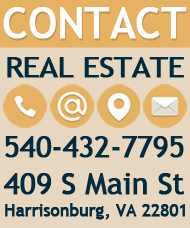 The Commissioner of the Revenue is elected by the citizens of Harrisonburg to a four-year term of office and serves at the pleasure of the voters. The Commissioner of the Revenue holds office as an agent of the Commonwealth of Virginia, as well as local governments, and is the assessing officer on the local level for those taxes and licenses prescribed by state law and local ordinance. More information about the Commissioner of the Revenue Karen Rose. [57KB] The Mission Statement of the Commissioner of the Revenue. 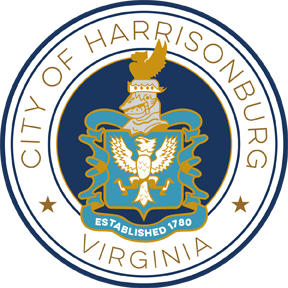 The City of Harrisonburg Commissioner of the Revenue makes every effort to ensure that the information provided on this site is correct, complete, and up to date. However, since the law is subject to constant change and interpretation, that cannot be guaranteed. For forms relating to a business license. For forms relating to business personal taxes, business excise taxes and business representation. 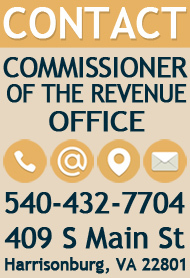 Information regarding requesting records from the Commissioner of the Revenue. View dates in the city calendar.